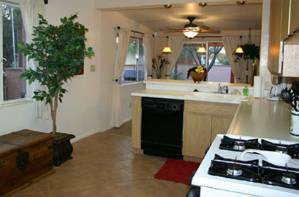 "Desert Sun", a lovely, centrally located 3 Bedroom, 3 bath home in the peaceful and wonderfully friendly old Sam Hughes Historical Neighborhood. Imagine enjoying a cup of tea or coffee in the early morning as you sit on your front porch or in your living room and watch the sun rise in the east. Then, at the end of the day, relax in your dining room or on your back porch with friends and your favorite beverage as you watch the sun set in the west. There's nothing like the desert sky. 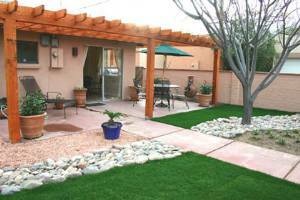 Just a short stroll to restaurants, markets, University of Arizona, shopping, entertainment, parks and city transportation. This home is located in the middle of everything but you'd never know it because it is so quiet you can actually hear the birds sing. 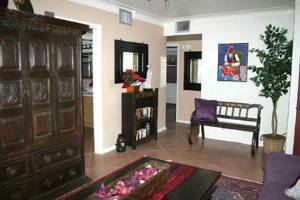 This home was built in 1952 and within the last year has been remodeled & tastefully redecorated combining ethnic, antiques & contemporary furnishings. Please Inquire! We have put together a small shopping cart (amenities bar) just in case you may have forgotten any items. There is a price list and you can take care of these charges at the end of your stay. We've also stocked a wine rack for your convenience. The price of each bottle is also on the price list and can be taken care at time of check out as well. And to make your stay perfect, if you would like to have us furnish your refrigerator/cabinets, we offer a pre-arrival shopping service based on cost/hourly rate. Coming in for any of the holidays? We will be glad to supply decorations & set up at your direction on a cost/hour rate basis, and we’re good…really good at this. Above all we want to make this stay as memorable as possible. If you need anything just ask and we will do our best to accommodate you. Please let us know at time of booking or as early as possible if you would like any of these services. Did you know that there are great hiking trails surround the entire Tucson valley and if you're a golf enthusiast, you already know that we have some of the best golf courses in the world (private & public)! Etc, etc, etc.... The list goes on and on. There is so much to see and do in and around our beautiful city. All Waiting Just For You!!! Won't you come and join us? Stayed here for a week during our daughter's graduation from U of A in May 2008. Clean throughout, well kept and a quiet neighborhood. Would recommend to anyone! We came to Tucson for a week and were fortunate to have the ideal place for our family to stay. It was exactly as described on the website! This house has just the right features and location so we could enjoy being together. The house has a great design that affords privacy, when you need it, and room to be together, when you want it. 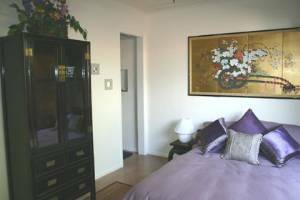 It is located near shopping, parks, and restaurants and is a good home base for sightseeing. 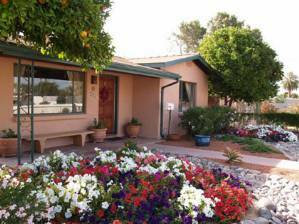 The lovely, flower-filled yard is the perfect place to relax and unwind. We enjoyed preparing meals in the easy-to-use kitchen. 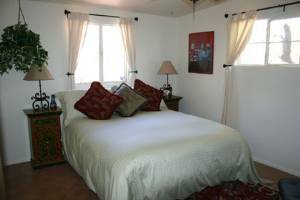 The owner was very accessible and went out of her way to make sure that we were comfortable and had everything that we needed. We came together from several parts of the country and were pleased to find everything we needed for our combined vacation and family celebration. We couldn’t have asked for more and hope to return again soon! Tucson Gem & Mineral Show is our busiest 2 weeks of the year. Therefore, there is a 20% up-charge & a 2 week (14 day) minimum stay starting January 27 thru February 12. Deposit: 50% deposit due at time of booking. 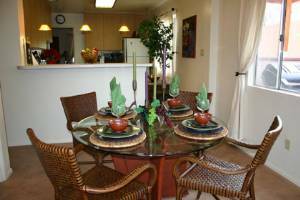 Any additional rental rates are required to be paid 30 days prior to arrival. 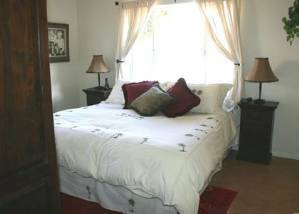 $150.00 Cleaning Deposit is required at time of arrival (cash only). Any & all loss or damage to this property or it's contents during your stay or any excessive expense incurred in cleaning this property, over your original deposit will automatically be charged to the credit card we have on file for you. Any replacements or repairs will be handled ONLY by management. Please report breakage or loss as it happens so that we might take care of it immediately for your comfort & convenience and that of others that may arrive after your departure. As in any hotel where you are a guest, we require a valid credit card at check-in that is kept on file in case of damage or loss expenses or if there is any additional cleaning costs above & beyond your $150.00 cleaning deposit. Cancellations and Refunds: Cancellations prior to 60 days - 100% refund. 30 -60 days - 100% less a $100.00 processing fee. Should there be a cancellation within 30 days of your stay, you will be responsible for any loss in revenues (rate or time difference) that are incurred plus a $100.00 processing fee. All rates and policies are subject to change without notification. Other Fees: During the summer months, May thru September, there is a $225.00/month or $7.50/Day up-charge for the air-conditioning. High Speed Internet/DSL is available at $2.00/Day.